Welcome to Santa Teresa! Located near the city center and stuck between Lapa and Gloria, this charming neighborhood in Rio mixture bohemian, art and history in double dose; delighting visitors and captivating, increasingly, the inhabitants thereof. 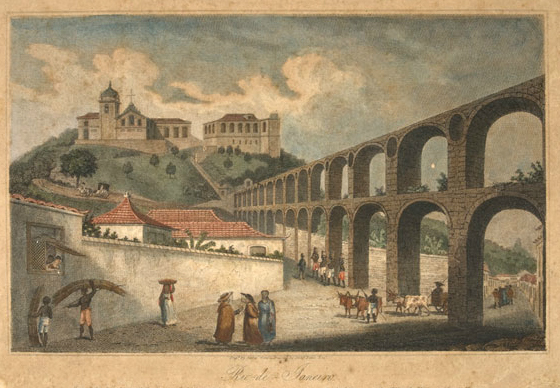 Santa Teresa is at the top, the most interesting way to “up” or “down” to / from Santa (affectionate and cool nickname) is by “cable car” which in its path passes over the “Arcos da Lapa”, ancient 18th century aqueduct, from the colonial times in Brazil. It is true that many people who come to Rio not know Santa Teresa. So, we have prepared this post to show some of the most interesting and creative neighborhood of Rio. A place that seems to have stopped in time with its old houses, palaces and narrow cobblestone streets. The neighborhood features historic buildings, some very well-preserved, but others need painting and restoration. Even that collaborates to create a picturesque atmosphere in Santa Teresa. Its streets are paved with ancient stones that lead tourists on their walks. Much sought by former Rio aristocracy, the neighborhood, also houses some traditional families in old mansions and many other middle-class residents seeking tranquility and escape from the apartments. During the 60s and 70s, many artists moved to St. Teresa and today the neighborhood together is composed by – as well as artists – intellectuals, academics, military and politicians who live in perfect harmony. In a hill climb to the neighborhood, it is located the Convento de Santa Teresa which gave name to the place. Its construction began in the second half of the 18th century, the church that sits next to it has become a point of reference, present in numerous paintings of the time, as the work the Aqueduct with Matacavalos Street (now Riachuelo Street), etching colorful Richard Bate and James Storer, dating from 1820. the monastery was intended to house the order of Teresian and Discalced Carmelite nuns still live and where there is even a traditional carnival block called Carmelitas, and, legend says that its name due to a nun who would have jumped the convent wall and mingled with the revelers. Prepare the body cause you’ll go up and down hills, but up there nothing is far away. If you walk up start with the colorful and famous Escadaria Selaron, one of the major icons of the neighborhood. Its original name was the Escadaria do Convento de Santa Teresa, but a painter and ceramist Chilean rooted in Rio, called Jorge Selarón, made the place one of the most popular sights starting alone in 1994. Prior to 2000 completed the 215 steps and 125 meters of the staircase, with more than 2000 different tiles, from more than 60 countries. The staircase was heritage listed by the city in 2005. Another place to meet is the Parque das Ruinas, former home of Laurinda Santos Lobo (personality of Rio society of the 20s), which is 650 meters after the Selaron. The park is located on Rua Murtinho Nobre 169, 400 meters near the Rio Forest Hostel, and open Tuesday to Sunday from 8h to 18h. Today serves as a cultural area, preserving its original architecture of the brick, metal and glass structures. Joining the ancient to the contemporary. A great place to make beautiful pictures! Entrance is free. The panoramic view of the park is privileged, facing the Guanabara Bay and the city center. From there you can also enjoy the Sugar Loaf, part of Orla and Arcos da Lapa. Following the path, you can go to the Museu da Chácara do Céu. There is a small bridge that connects the inside of the Parque das Ruinas at the entrance of the estate of heaven – access costs only R$ 2,00. In the Mansion, is a collection of particular works of art of the entrepreneur Raymundo Ottoni de Castro Maya, who lived on that house, redesigned in 1954 in modernist lines integrated into a garden where also can be seen the Guanabara Bay. Open daily (except Tuesdays) from 12am to 5pm. Is on Rua Murtinho Nobre, 93. At this point of the tour, you should already be in time for lunch. Then, if necessary, you can go to the Largo dos Guimarães, gastronomic point of the neighborhood, the Almirante Alexandrino Street, and choose one of the great restaurants that exist there. Including the Portella, the Espírito Santa and the Bar do Mineiro (feijoada) are good options. Then walk by the studios, breathe art and buy souvenirs, clothes, paintings and interior design items. At the time to go you can go down by bus, taxi, on foot or by cable car. Of course, if you are staying in Rio Forest Hostel is just go back to number 517 of the General Murtinho. You want better than that? So yeah, already arrive at the Rio Forest Hostel savoring a delicious caipirinha and diving in the pool inside the woods. Among its illustrious residents include: Carmen Miranda (actress and singer), Djanira (painter) and the great musician Pixinguinha. Staying in Rio Forest Hostel in Santa Teresa, have you ever wake up in the place where things happen. Beside of Lapa, in a renovated farmhouse, where the former contrast with the contemporary makes the place even more special. In Rio Forest Hostel you pay little, with comfort and services at your disposal. Browse the site and meet our facilities and fares. It will be a pleasure to welcome you!